Recently I wrote an article on 7 Reasons Why you Should be Using Google Apps and few of my readers suggested that a guide on how to use Google Apps would be useful. Google Apps for Your Domain is a software bundle aimed at small and mid size businesses. Google Apps lets you offer email, instant messaging, and calendar accounts on your own domain name (for example, you@yourdomain.com), to keep your group close and build its online identity. So here is the detailed guide on how to set up and configure Google Apps for your domain. Google Apps has different versions like small business, enterprise, educational and family or group. I’m going to explain how to configure the standard version which is completely free of cost. The premier version is available for a limited 30 day trial. Once you sign up for Google Apps, you will be taken to the registration page, where you need to enter your domain name or get a domain name for you. After you complete the sign up process you will get a confirmation mail and after that you can login to your cPanel (the url of the cPanel would be available in the mail). Once you log into your cPanel, you can configure all your user accounts, mails, docs, calenders etc. The service dashboard (cPanel) has the following options. Before I explain each of these settings, lets first configure our domain settings. You can find a navigational link named “Domain Settings“, this will show you the domain settings. You can give a title for your organization, select the language, time zone and add custom logo. The header logo will be available in all the screens of Google Apps. Check out the custom logo I have created for my domain. Once you have added your logo, save the changes. 1. Start Page: Start page is the page which allows your users to access Google services and other information from a single place. The URL of the start page can be customized to point to your domain. For this you need to create a CNAME record in your domain and point it to Google. Once this is done, your users can access the start page with custom URL like start.mydomain.com where start is the new CNAME created for your domain. 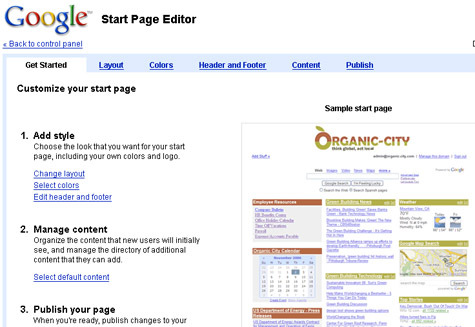 The start page can be customized using the page editor. Here you can change the look and style of the start page. Here you can select a layout, change colors for text and links, add a header and footer and also add content. Once you have made the changes, publish the content and all your users will be able to login from the URL. 2. Email Accounts: The advantage of using Email address with Google Apps is that you can create unlimited number of Email accounts with your domain which has 2GB storage space and all the features of Gmail, including POP3 access. For using this you need to change the Mail Exchange (MX) settings in your domain. It should be configured to point to Google. Detailed steps on how to change MX settings is available when you activate the mail service. To access the mail, you can either use http://mail.google.com/a/yourdomain.com/ or you can customize the URL to mail.yourdomain.com by adding a CNAME to your domain. The next part of this tutorial will cover how to configure web page, calenders and docs & spreadsheets. If you enjoyed reading this article, please Stumble it or share it using social networks. I’ve been meaning to get going with Google aps. I’ve bookmarked your post and will come back to do it tomorrow. Great article Nirmal, it shows that you’ve worked on it quite a bit. Bookmarked it for future reading. I have configured email for google apps, however still there are many things which I am unware of, looking for your future posts for this. Would like to read your perspective …. Awesome guide there. Very useful. I’m planning to use it very soon. This will come in handy. Thanks. Second part will be available soon. Glad that you liked it. I think you should definitely use it. Cool post man. I’ll try out the Gmail thing soon. Great post there buddy , finally i have understood what Google Apps is all about , looking to the next part of this series . Agreed that sometimes it may cause conflict, I’ll check it up. Thanks for pointing it out. You should be trying out Google Apps. @ nirmal : Eagerly waiting for it, so that i may be able to use it more effectively. Also i might get some new stuff to learn as well. Woah. Fantastic article. Never knew this kind of integration was possible. Thanks for all the hard work! Thanks for the post. I really understand it better. I will surely try it to this weekend. Kewl. you’re good at writing dummies article too! Great going buddy.! Very useful info. I am just through with my new website, and I guess your post will be of definite help in setting it up for my site..
very useful guide you’ve put together! I’m sure it’ll be useful to many! Stumbled it..
btw, I really like your template, very clean and fresh! which ip to put there???? Please explain the problem, I didnt get you. but it doesnt seem to work. I think I am done with my CNAME records ’cause it says, the validation is done. There is no message “validate your domain” . I even confgured the MX Records. The status in my control panel is active for email. but when I go to mail.mydomain.com it doesnt load. Insted it shows that the page cannot be displayed. Thanks! I really want to start using Google Apps, but somehow I never really got to it. I think I’ll try it next weekend. We have problems with conflicts between ID’s for google and google apps. For example I shared some documents with colleagues using my general google docs account. One participant who has a google account and has his work email associated with it – could not open it and was invited to open a new google account in order to see the documents – he did and it created an account on our google apps site (which was created purely to explore the possibilities and is not used). Now he cannot log of of google apps to log back into his normal google account as his email is not linked to apps so for example he can see his calendar but not edit it. Help! nice tutorial 🙂 Now Google gives 7GB for email account.